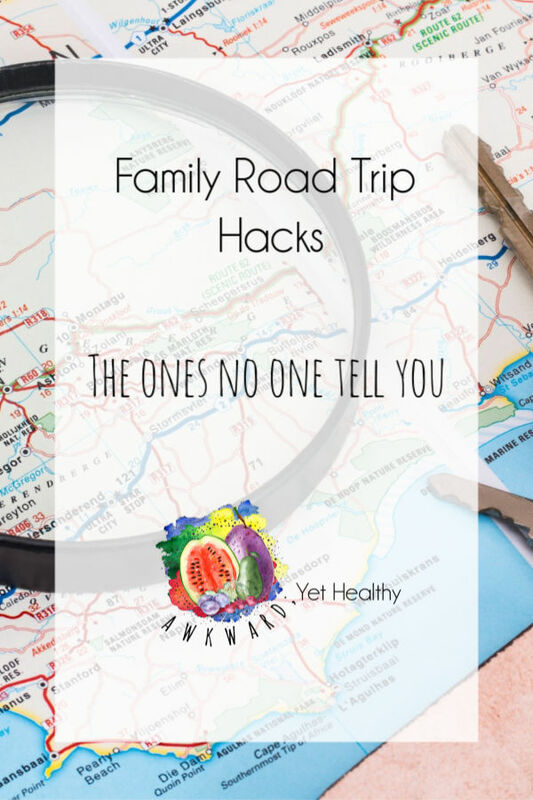 Family Road Trip Tricks | Tips, Tricks, and Hacks | Awkward; Yet Healthy. We love a good road trip. This much is clear. We tend to take at least one per year. And when I say road trip I mean any drive longer than about 6 hours. Honestly, 6 hours is nothing. Once I have to plan for a meal in the car it becomes a true ROAD TRIP. Which requires some planning, hacks, and, of course, packing. In the interest of keeping this short(ish) and readable, I’ll split it up into a couple different posts. This one will focus on how we handle the drive itself and what/how we pack for a successful trip. Next up I’ll talk more about resources/ apps/ planning tools I love. So let’s dive in shall we? Let’s start with what we pack and how I pack it. Then we’ll move on to how to keep everyone happy in a car for a whole day. In a nutshell, we pack the following. For any vacation taken via our road warrior. Clothes. Duh. But when packing for a road trip I usually pack only enough clothes for 5 days. Chances are we’ll be staying in a house/ apartment and we’ll have access to a washer and dryer. So I don’t waste time here. Even though we technically could bring ALL the clothes, we don’t. Medicines. Obviously, I travel with a slew of medicines and medical supplies thanks to the Type 1 Diabetes, but I also bring along anti-nausea stuff, basic pain relief, and allergy meds. Just in case. Our younger son does get car sick on occasion, so we bring stuff along just in case. Usually in the form of essential oils, because they work the best for us. Books and toys. I can not stress this enough. LET THEM BRING TOYS. Let them pick the toys. Give them a small basket or bucket and tell them to pack what they want for the car. Same with a few books. We read a story every night at bedtime, even when we travel. So we bring along books. Typically the Usborne compilation books are our favorites for travel. Electronics and cords: GlocalMe, Kindle Fire Kids edition tablets, laptop, converter plug, USB cords for everything. Links for all this stuff is in my kit below. Have no fear! Stepstool. This acts as a computer stand in the car and my sanity saver everywhere else. It’s just a handy thing to have! Juice Plus. Seriously, we never leave home without it. It helps keep up healthy (and regular) and removes the guilt. Pillows and blankets. No explanation needed. Food and drinks. See above. Vacation Specifics. If we’re going hiking, we pack hiking boots. If we’re going to the beach, we bring beach chairs. Fairly straightforward, no? Atlas. Trust me on this one. It only takes one wrong turn in Northern Montana with no cell service to really throw you off. Just bring it. Basic car travel essentials: flashlight, jumper cables, salt/kitty litter, air pump, first aid kit, puppy pads, bug spray, sunscreen. You know, the stuff you should have in your car anyway. You can accomplish this easily by buying it all together. Everyone gets a laundry basket. No, I’m serious. I pack a laundry basket for everyone, and then I stack them up in the car. Everything we don’t need while driving, or that we will only need when stopped, goes in the back. Things like jackets might be immediately accessible, while other stuff might be buried. I tend to pack things in the order in which we’ll need them. I keep plastic bags handy too for trash and laundry. Easy peasy. Our snacks and drinks are packed in a wide mouth bag and put behind the driver’s seat so that the front passenger can reach it easily. Once my kid’s feet reach the floor, that plan will have to change. If it’s just me and the kids the food and drinks go in the passenger seat so I can fling them in the back as needed. The laptop is put behind the center console on top of the step stool so that it can be plugged in via the converter, but also central so the hooligans have a good view. I start the movie playlist before we leave and then just let it run the entire trip. They either watch it or they don’t. The tablets are up front with the adults until we decide to cave. Both boys keep their water, small bin of toys, a pillow, blanket, and their bears in their seats with them. They are both still in child restraints (and will be for a long time) so it’s key that they can reach what they need. It is EASY for a car to become complete chaos on a road trip. I have developed a system to combat that, and I am pleased to say it works quite well for us. First off, all trash goes into a bag that is replaced every time we stop for gas. I also do a quick sweep for trash and loose food when we stop. Second, I am a freak about the laundry baskets and bags. Everything has its place. Every time we stop I do a quick check to make sure that everything goes home. Trust me, 30 seconds of collecting loose cords and stuff at each stop is much better than 2 hours of repacking everything later on. Lastly, I pack the car with a plan. I mentioned it before, but I pack things in order of need. Our laundry organized and when it’s clean it goes back into the baskets. The kids get asked to put their toys back in the bags multiple times a day just to keep it under control. All the cords and cables live in a bag together, all the medical stuff in another, and all the snacks in another. And here’s the key, they are always IN THE SAME PLACE! Easier said than done, I know, but we actually have a lot of success here. We use a lot of our driving time as quality family time, but there’s also period where we just need quiet or everyone wants to do their own thing. Here’s what I have learned on how to keep everyone happy. Podcasts and Audiobooks. Pretty straightforward, but downloading these ahead of time saves any anguish of losing cell service. It’s also how the husband and I ‘read’ together. We actually do read books together, but a long road trip can usually result in an entire audiobook that we can discuss (or argue about). Or countless podcast episodes we can dissect. Movie Playlist. This is so freakin’ simple and I am embarrassed that it took me so long to figure it out. I download movies from iTunes onto my computer’s hard drive. Then I make a playlist in iTunes. It took a few years to think of bringing the computer at all, and then it took one hellish (yes, they aren’t ALL good) race back from South Carolina to Houston to beat Hurricane Harvey to think of the playlist. Now, I just let it run. How do we keep the laptop charged? The nifty plug converter in the kit below! TOYS! See above. I let the kids pick ’em. Internet. We invested in a small satellite internet device called GlocalMe. It’s ‘meh’ at best, but in a pinch, it really comes in handy. Stop the freakin’ car. If everyone, or just one person, is being a total butthead… we stop. We run, play, eat, whatever. Unless we have a super tight timeline, there is literally no harm in this. Everyone feels better after! Don’t discount old school games/ activities. Tell each other stories, play eye spy, punch buggy, etc. It’s a change of pace from the electronics and it makes for some really fun memories. Snacks. Do I really have to elaborate here? Everyone loves a good snack. And when we’re road tripping sometimes we eat all our meals in the car. This is typically when the kids get all the ‘good stuff’ that’s usually off limits. Thank god for Juice Plus! It makes these splurges guilt free for mama. Use the windows for their intended purpose. Seriously, look out them. One of our favorite topics is ‘how did that landform get there?’ We learn a TON. Don’t worry, I created a quick kit for all the cool stuff I mentioned (and some stuff I didn’t) in this post to help you build your road trip arsenal. Check it out! Intrigued by my awkward way of packing? Come hang out in my Facebook Community to see all my other adventures!